A late surge, including a hat-trick in 11 minutes by Gordon Whyte, saw Kyles Athletic come from behind to beat Lochaber 6-2 at Spean Bridge and oust Kingussie from the top of the Marine Harvest Premiership. Kyles were helped on their way by Kingussie's 3-1 defeat away to Oban Camanachd. 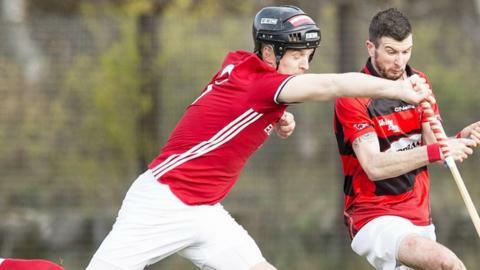 Fort William are still looking for their first point after their 2-0 defeat by Lovat in a game switched to Kiltarlity while Kinlochshiel remained in the top half of the table when they beat Glenurquhart 2-1 away. And in their rearranged RBS MacTavish Cup tie in Portree, Skye held off a late surge from Kilmallie to progress 4-3. Lochaber got off to a great start when Shaun Nicholson put them ahead and it took Roddy MacDonald almost half an hour to equalise. Stuart Callison put Lochaber ahead again midway through the second half but Whyte's hat-trick swung the game Kyles' way before Grant Irvine then Innes MacDonald rounded off the scoring late on. Even a point in Oban would have kept Kingussie top but Lorn Dickie and Daniel Cameron were both on target for Camanachd within the first 10 minutes before Willie Neilson made it 3-0 early in the second half. Ryan Borthwick's late penalty then came as only a consolation for Kingussie. It took Lovat over an hour to break down a determined Fort William defence but goals from usual suspects Greg Matheson and, in the penultimate minute, Kevin Bartlett kept the points in Kiltarlity. This leaves Fort two points adrift at the bottom and the only team drawing a blank after four games. Glenurquhart's hopes for revival fizzled out when Fraser Heath's goal was bracketed by a double from Kinlochshiel's John MacRae. Skye had to start their MacTavish tie without policeman Iain "Crossal" Nicholson who came across an accident on his way to Portree so had to go on the bench when he arrived. However, the policeman's lot turned out to be a happy one and Nicholson came on as a substitute to take part in an eventually narrow victory over Kilmallie. Danny Morrison and Jordan Murchison with a penalty put Skye 2-0 up before Ryan Stewart's response rapidly sparked Murchison into further action. Kenny Campbell made it 4-1 just before half-time but Skye were denied the luxury of a cruise to the finishing line when Duncan Rodger got a second-half double which turned the last 20 minutes into a cliffhanger. Inveraray have begun to show some form in the National Division and at Yoker, Grant Griffin scored a late winner to narrow the deficit to a single point after leaders Glasgow Mid Argyll had pulled them back twice.